We're getting a big headstart this year for this MASSIVE job coming up in SYDNEY for more of you gorgeous MALE & FEMALE HAIR MODELS! Hair Expo, as always, is going to be absolutely HUGE! For this event, we will require models for look and learn shows, main stage runway, gala night shows, and even promo positions within the event. Because this event is so large scale, you may be cast in more than just one show! 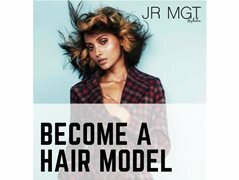 All jobs for Hair Expo - from runway to promo - will be paid. We are currently still organising a few logistical matters but just want to get a head start booking you all in for the event! Hair Expo 2019 will be in SYDNEY however, if you are from interstate, we're more than happy to submit you providing you organise your own flights and accommodation. We have done this with plenty of models previously for Hair Expo and they've all had incredible experiences! We look forward to your submissions, it's going to be an absolutely amazing experience this year!! We need females who are open to having their CUT AND COLOURED. There may also be some spots for style-only models however this cannot be guaranteed.